Children aged 8-12 can be hard to please. They have a definite idea of what they like, but it might not necessarily be what you the adult would expect or approve of. It could be anything from cuddly toys to wildly unsuitable video games. The cliche about kids this age is that they’re only interested in expensive bits of technology. But whilst you might not be able to get away with a stick and a cardboard box like you could with a toddler, many tweens still like the simple stuff. So if you’re trying to please one of these hard to please pre-teens, I wanted to pick out some of the biggest hits from products we’ve reviewed this year. Click through and you can read our full review. Claymation Studio by Honestech is undoubtedly our favourite product we’ve reviewed this year – and since we reviewed it, it’s come down in price to £30. 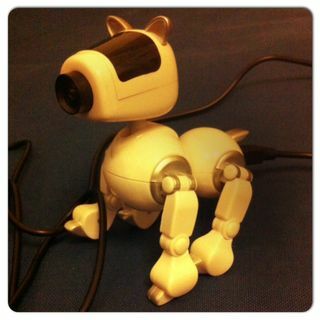 It’s a system to let children make animated films, via a camera that looks like a dog. My children have gone back to it time and time again – it’s creative, imaginative and easy to use. Doggycam is currently being put to work making a Lego animation. This is one dog you can give for Christmas. Lego video games are the ones to go for if you’re buying for a junior gamer. We enjoyed Lego Batman 2 this year, but the older titles in the Lego video games series are worth revisiting because they will have come down in price now. Our favourite is Lego Harry Potter. These games are great for promoting co-operative play and (in theory) will encourage warring siblings to play nicely together. Stationery is a fairly safe bet for this age group. Notebooks, pens, things with owls on them etc. And if you’ve got a junior drawer in the house, my son would like to recommend How to Draw Comics the Marvel Way. We love this book. Books in general are another good bet for this age group – if you can remember it as a classic from your own childhood then try it on a new generation. Black Beauty, The Hobbit, E Nesbit, Noel Streatfield and the rest. Here’s our pick of books that even reluctant readers will like. And if you are buying a Christmas gift for a pre-teen who’s not your own and are scared you’ve got it wrong, then there is only one failsafe solution – tape a chocolate bar to it. Works every time. What are your 8,9,10,11 & 12 year olds after this year?